Are high profile public officials using Twitter as a noble tool to bypass the proverbial “mainstream media filter” and communicate directly with constituencies? Or do they just see it as yet one more wall in the online echo chamber, something merely to influence and/or amplify mainstream media stories? The answer probably lies somewhere in between as I found from examining the Twitter feeds of several prominent current and former U.S. government officials. Some major official figures have genuinely embraced the medium. Karl Rove tweets prolifically, sparring with the Center for American Progress, and publicizing op-eds that he enjoys and with which, of course, he agrees. His Twitter behavior shows someone committed to the kind of conversation and community that typify the medium — remarkably, he follows nearly as many people as follow him. As a progressive who enjoys intelligent debate, I regularly read Rove’s op-eds in the Thursday Wall Street Journal. But until Twitter, the only public rebuttal I could make was muttering under my breath and shaking my head while riding the subway. Watching our elected officials turn their Twitter accounts into publicity outlets for their cable news appearances strikes me as a sort of redundancy ad absurdum." 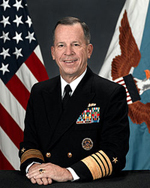 Admiral Mike Mullen, the chairman of the Joint Chiefs of Staff, is another public official that has, I think, used Twitter very effectively. In some ways, Mullen hasn’t really embraced the communitarian nature of the Twitter community; for example, his account only follows the high profile tweeters being indexed by WeFollow.com. It is also quite possible that a staffer rather than Mullen himself is uploading the posts. That said, the posts do seem to come directly from Mullen and expose an otherwise unseen side of the country’s highest ranking military officer. His posts are chock full of empathy, enthusiasm and gratitude, doling out praise and offering candid status updates. Recorded a video greeting to Gold Stars Wives of America. The network of support they offer each other and others in grief inspires me. Arrived home last night, terrific trip! Rich in experience and feedback. Troops proud of difference they are making, and I am proud of them. Neither of these men use Twitter to simply advance an agenda, show off their savvy understanding of digital media, or generate publicity for themselves. They use it for different purposes — Rove for discussion and Mullen for dispatches — but in ways that are appropriate both for their stations and for the medium. I have yet to hear a single intelligent remark Twittered by an elected official… The vacuous utterances Twittered daily from members of Congress make me wonder how they have the time to spend keying in on such banalities and marveling over the narcissism implicit in their belief that anyone cares about their every single thought and reaction to contemporaneous events. To be fair, the eloquence and insight of elected officials is pretty constrained by Twitter’s 140 character limit. And there’s a learning curve that representatives (and their staffs) have to grapple with when dealing with this new platform. But if the way we communicate influences the way we think, how might a medium that encourages instantaneous, ineloquent and unsophisticated communication affect our legislators’ deliberative processes? Barbara Boxer (D-CA): Gearing up to talk health care w/ Carlos Watson on MSNBC– 11:05am EST, 8:05am PST. Tune in! John McCain (R-AZ): Watch Hannity tonight — on @ 9:00 pm discussing health care and the need for the right reform! 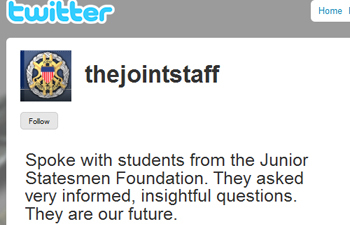 There certainly are some good examples of public officials using Twitter to communicate candidly with new audiences. In addition to Mullen and Rove, the British Prime Minister’s office maintains a fine Twitter account, as does Iraqi Deputy Prime Minister Barham Salih. People want nothing but mirrors around them to reflect them while they’re reflecting too. You know, like the senseless infinity you get from two mirrors facing each other across a narrow passage. Usually in the more vulgar kind of hotels. Reflections of reflections and echoes of echoes. No beginning and no end. No center and no purpose. What government officials do you follow on Twitter? Which are your favorites and least favorites? Let us know in the comments below. One of the most laughable ones is Michael Steele. He has two twitter pages. One isn’t used and the other is sheer puff. Rove does a good job with his page as does Joe Scarborough, who I honestly think is flying a balloon on seeking office with his twitter page. In Australia, TweetMP is tracking federal members twitter accounts. We have found that some of the accounts are only used for media releases and to announce media appearances. Others are getting the conversation a bit more, like @kevinruddpm, @TurnbullMalcolm, @katelundy and @sarahinthesen8. Hopefully more MP’s will join and use twitter to interact with the public. http://politwitter.ca/ Tracks Canadian federal MP’s and provincial MLA’s. Politwitter also tracks all political tweets, not just politicians. Thanks for including these additional resources, Trevor and Steve! I’m sure our readers will check them out for more info. Just curious as to everyone’s thoughts on officials who send a generic Twitter “thank you for following me” DM (direct message), once you start following them. Is this too generic? Bad? Good? A good read, thanks for putting it out there. I have to disagree with Mr. Cook, a number of the US congress members push out personal political statements, and even personal life statements, on a regular basis. I am reading direct statements by Culberson and Burgess now as I write this. The generic Direct Messages only work for those who don’t know they are generic (anyone new to Twitter). See all the tweeting U.S. officials at http://www.congressional140.com. All the tweeting U.S. congress members at http://congressional140.com.